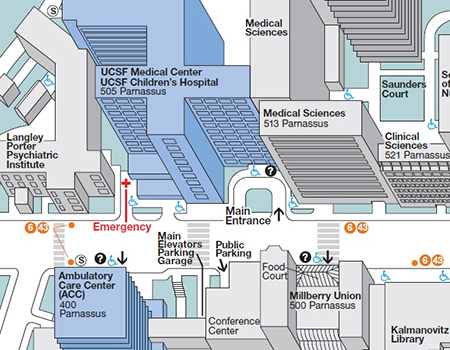 The School of Medicine Dean's Office is located in room S-224 of the Medical Sciences Building (map PDF) at 513 Parnassus Street. Enter through the glass doors at the Main Campus entrance and proceed down the hallway to the elevators on the left. Take the elevator to the second floor (or walk up the flight of stairs to your right). Turn right out of the elevator bank (or on top of the stairs); follow the hallway around a bend to find the dean's office reception desk at S-224. Parking is available on seven levels, from H (at the Parnassus St. level) through B (at Irving St.). Behind the School of Dentistry, 707 Parnassus Ave., (take 5th Avenue to Kirkham). Parking and fee lot machines on all four levels. Take Kirkham past Westside/Kirkham Lot and up the hill. Fee lot area and machine located across from Beckman/Koret Vision Center is utilized primarily by Beckman Vision Center patients.